Introduction: Placenta Growth Factor (PlGF) is a key protein in the “angiogenic switch” in the pathologic setting that stimulates tumor growth via modulation of VEGF’s effects and via inhibition of apoptosis. Plasma VEGF levels are elevated for weeks after minimally invasive colorectal resection (MICR) and may encourage residual tumor to grow. The purpose of this study was to assess the impact of MICR for cancer on plasma PlGF levels. Methods : Blood samples were collected preoperatively (PreOp), on post operative day 1 (POD1), POD3 in all patients. At various time points during weeks 2 to 4 after surgery, samples were collected from a subset of patients. Samples from 7 day time blocks after POD 6 were bundled and considered as single time points to permit analysis (POD 7-13, 14-20, 21-27). 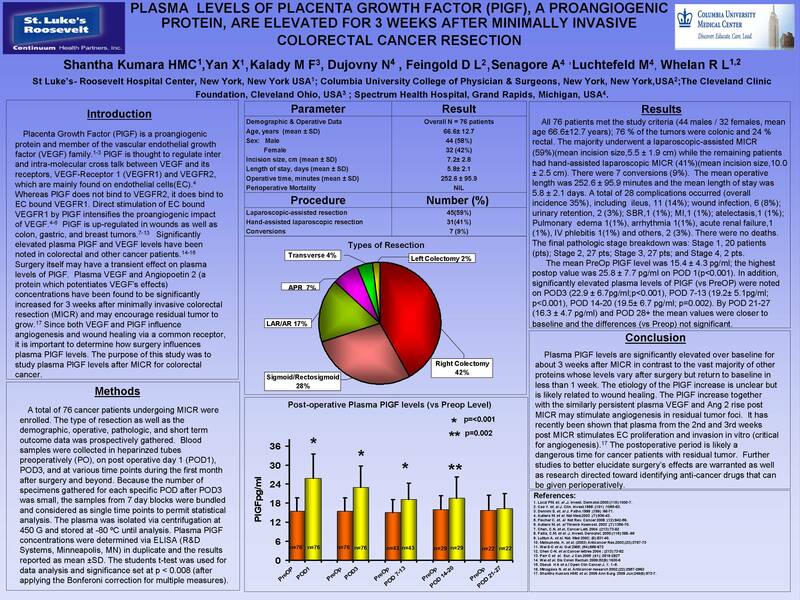 Plasma PlGF levels were determined, in duplicate, via ELISA and the results reported as mean ±SD. The t-test was used for data analysis (significance, p<0.01 after Bonferroni correction). Results : Seventy seven patients were studied (75% colon, 25% rectal tumors); 59% had laparoscopic (mean incision, 5.5 ± 1.9 cm) and 41% hand-assisted (mean incision 10.0 ±2.5 cm) MICR. The mean length of stay was 5.9 ± 2.2 days. The mean PreOp PlGF level was 15.5 ± 4.3 pg/ml; the highest postop value was 25.8 ± 7.6 pg/ml on POD 1(p<0.001). In addition, significantly elevated plasma levels of PIGF (vs PreOP) were noted on POD3 (23.0±6.7, p<0.001), POD 7-13 (19.2±5.1; n=43,p<0.001) and POD 14-20 (19.5±6.6;n=30,p=0.003). By POD 21-27 the mean value (16.3 ± 4.7 pg/ml;n=22) had returned almost to baseline. Conclusions : Plasma PlGF levels are significantly elevated over baseline for about3 weeks after MICR in contrast to the vast majority of other proteins whose levels vary after surgery but return to baseline in less thanone week. The etiology of the PlGF increase is unclear but may be related to wound healing. The PlGF increase together with the similarly persistent plasma VEGF rise post MICR may stimulate angiogenesis in residual tumor foci. The postoperative period may be a dangerous time for cancer patients with residual tumor. Further studies are warranted.